Dungeons like Dragon Eye are probably why Icewind Dale is considered more of a dungeon crawler than Baldur’s Gate. 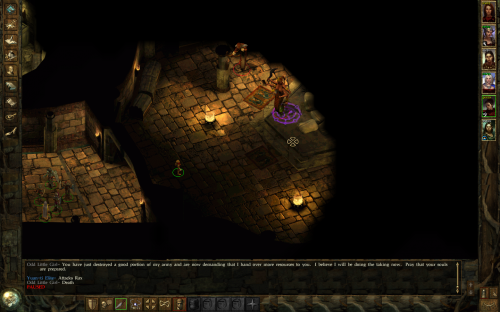 The thing is, I like dungeon crawlers to, just as much as whatever category Baldur’s Gate fits in. But let’s see what’s going on with these suspicious priests. 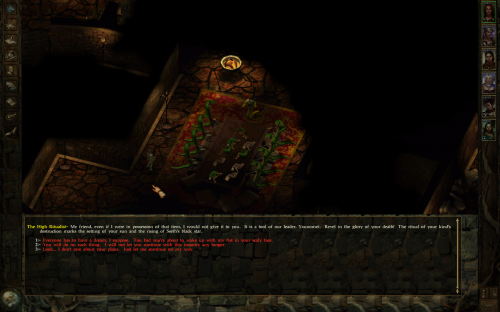 It took me a while to figure out, but after some messing about (and googling, I’ll admit it), I found that you have to talk with the guy at the entrance to the priest complex after exploring it entirely. I was able to point out some strange stuff in the area and this made them reveal what they really are – a snake worshiping cult. Unfortunately, it also made the entire area hostile and had them charge at me. 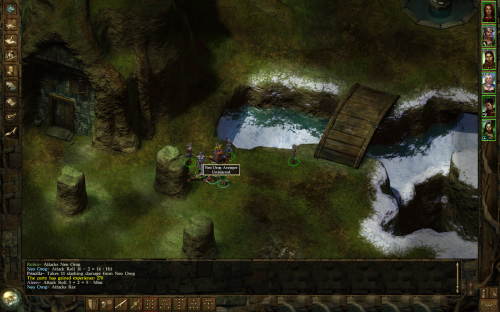 I’m actually saying I had to fight about two or three dozen priests, a bunch of Yuan-Ti and a troll or two at the same time. 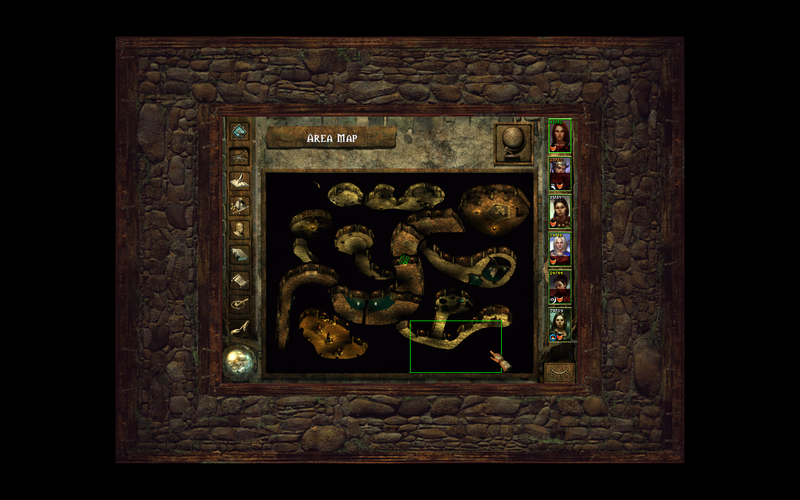 Luckily, the AI in Icewind Dale isn’t terribly smart. I had Lorelei and Priscilla stand at the doorway of the outside library and the rest of my party and the entrance hall, but out of range. All the enemies just huddled up around the door and ignored my other four characters, so I was able to pick them off without getting hurt too much. That being said, it was getting close near the end of it. There’s actually way more enemies here. They’re just out of line of sight. The only issue? Priscilla got Feebleminded. This is annoying. 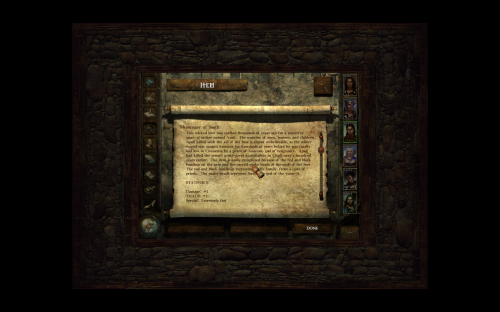 It’s a permanent condition which can be cured, but in order to cure it, you need to have the proper spell or scroll memorized. Since a feeble minded character cannot move and you can’t rest in Dragon Eye level 4, I was basically stuck, especially because I saved over my game. I thought I’d have to lose my saves or cheat to restore Priscilla, but then I got another bright idea. I can kill of Priscilla with the rest of my party, then go to town to resurrect her. I began attacking her and then, for some unknown reason, the feeble mindedness went away. I thought I got luck at first, but on that occasion, I died anyway, so I was forced to reload and it worked the second time as well. For some reason, attacking a character that’s feeble minded can snap him out of it. Yuan-Ti are snake people, basically. They also eat regular people. Once I’ve dealt with the initial wave, I was able to go back to area 3 of the dungeon to rest and heal every now and then, so the rest of the dungeon wasn’t really an issue. Oh, and there’s a level 5 to Dragon Eye. When a little girl appears in front of you to talk prophecies, then you’re bound to be close to your goal. This was another area where rest was prohibited. I guess the developers didn’t want to annoy the player too much, though, because they placed a captive adventurer party in the previous area, which gives you the option to watch over you while you rest. This means that instead of going all the way back to area 3, I could just go to area 4 every time I needed healing. 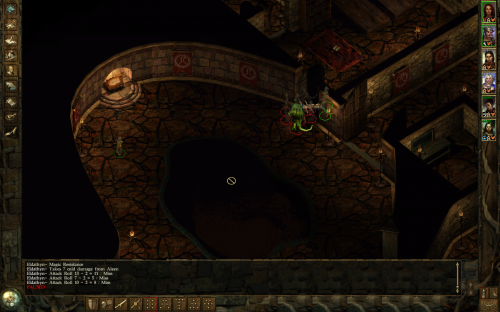 There was a lot of Yuan-Ti Elite in area 5 and a lot of them used bows, meaning I was taking a lot of damage. They also dropped enchanted arrows, which was a huge blessing, since I ran out of ammo a long time ago. One of them also dropped a nice new bow for Robin. I don’t know what “extremely fast” means exactly, but it can’t be bad. After a lot of going back and forth between area 4 and 5 to heal, I finally reached the end of this dungeon, where the boss was waiting with the Heartstone. On my first attempt, I was hoping she was the average dumb caster, so I tried to lure her minions away and kill them off. It didn’t work. She casts cloud and summoning spells and tries to enter melee. On my second attempt, I tried the same thing, except I hid a bit better, but ti still didn’t work. There were more than two attempts, but it makes no sense to mention all of them. I cast Bless and Haste on everyone before the battle. I activated Find Traps on Rax, because I knew there were traps in the room. I used a Summon Monster scroll to summon 6 beetles into the boss room, but far enough not to trigger anything. My entire party in and after the conversation was over, I immediately paused the game. Lorelei, Priscilla and Robin all targeted the boss who’s name I forgot. Rax used Thievery to disarm the trap between the party and the boss. Alana immediately started casting Prayer and Aleen cast a Chromatic Orb at the boss. She died within a few turns. 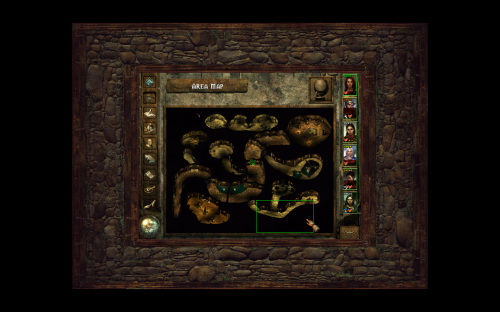 Meanwhile, I sent one beetle to each of the Yuan-Ti Elite, because I noticed they switch to melee weapons when an opponent is nearby, becoming much less threatening. The beetles died almost instantly, but it saved me some damage. Once the boss was down, I took down the minions one at a time with spells and ranged weapons. I got the Hearthstone, some items I couldn’t identify and a bunch of gold, gems and potions. Now it was time for the long trek outside. By the way, the final area looks like a giant snake. 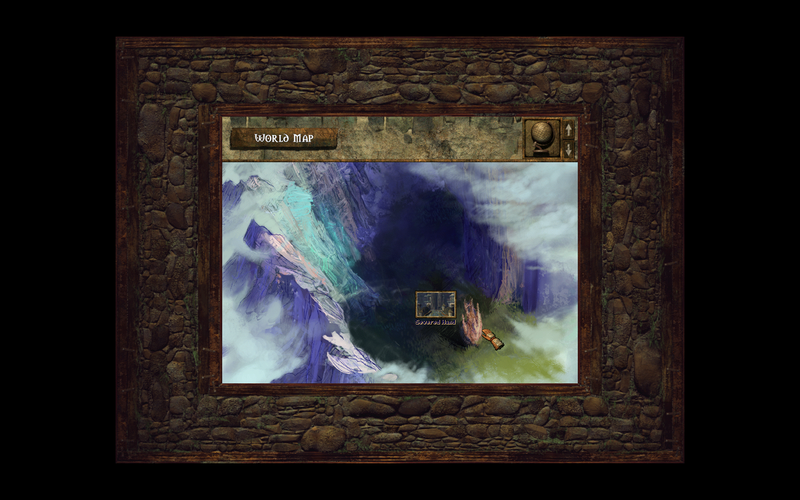 Maps following a theme is a common thing in infinity engine games. I got back to Kuldahar just in time to thwart an attack by some orogs (again, may have forgotten the name here). After what I’ve been through, these guys felt easier than goblins. I got to Arundel and then this huge revelation was dropped on me out of nowhere. They’re Neo Orog Scavengers, whatever that means. I won’t spoil it, so I’ll just say I have to go south now, to an ancient elven fortress, where an imprisoned archmage can help me with the Heartstone gem. I didn’t buy anything again. 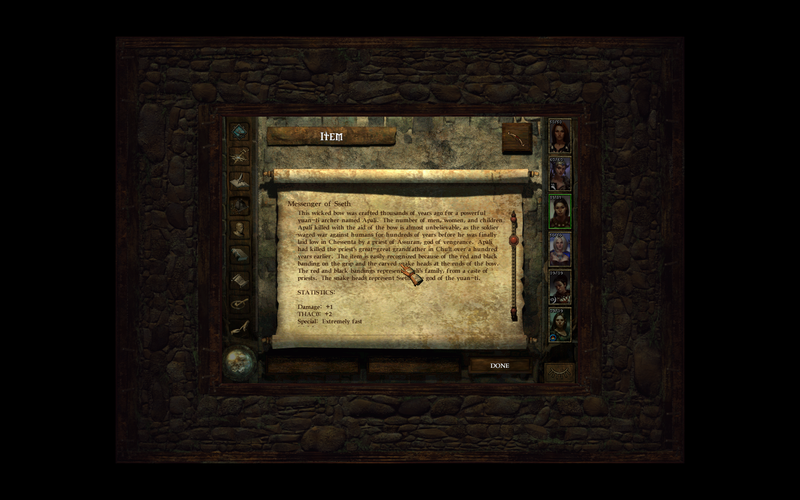 I did, however, equip a few of the items I collected in the dungeon. I got a new shield for Lorelei, among other things, giving her 4 extra armor class, or 4 less depending on how you look at it. I sold all my stuff and this got me close to 50.000 gold. Next time, we go to the south. 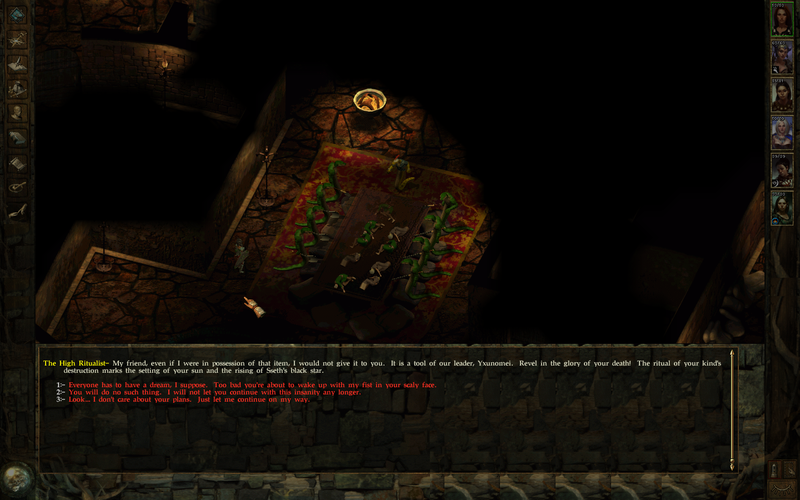 Severed hand is apparently an ancient elven fortress.